In the Stockholm District Court judgment of March 22, 2016, the UK company Textilis, Ltd (‘Textilis’) was found infringing, amongst others, the Swedish company Svenskt Tenn Aktiebolag’s (‘Svenskt Tenn’) figurative EUTM ‘Manhattan’ (shown below). The case concerned two questions, namely whether (a) there was infringement in Sweden and (b) the trade mark is valid. This case relates to the famous Swedish design house Svenskt Tenn Aktiebolag (‘Svenskt Tenn’) which was formed in the 1920’s. Svenskt Tenn owns the copyright to, inter alia, the textile pattern ‘Manhattan’, which is a renowned design pattern in Sweden, also registered by Svenskt Tenn as a figurative EUTM in 2012. Textilis is a UK company founded in 2013 that sells textiles and textile related products not protected by IPR’s in the UK. The products are sold online and on its website Textilis states, inter alia, that delivery within the EU is for free in relation to orders over a certain amount. On the website a so called ‘currency converter’ also existed whereby customers could convert the prices to SEK (Swedish krona). It was further possible to select Sweden as a shipping destination for placed orders. 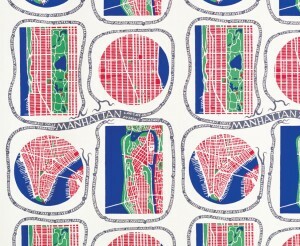 In addition, the design pattern ‘Manhattan’ existed on the website in relation to certain products. Svenskt Tenn consequently filed a lawsuit against Textilis and its owner arguing copyright and trade mark infringement and asked the court to prohibit Textilis from offering the infringing goods for sale in Sweden. Svenskt Tenn further claimed damages and asked for an injunction prohibiting such sales. Textilis in turn filed a counterclaim arguing that for the invalidation of the EUTM. Textilis argued that the trade mark lacked distinctiveness (Article 7(1)(b) CTMR) and consisted of a shape which gives substantial value to the goods (Article 7(1)(e)(iii) CTMR). On March 22, 2016 in case No T 14506-13 the Stockholm District Court found ‘on the documents’ (i.e. without oral hearing) that Textilis was guilty of trade mark and copyright infringement. As this is a trade mark blog, I will focus on the trade mark infringement and in particular the ‘Manhattan’ trade mark above. The court emphasised that the CTMR allows for the registration of any sign capable of being represented graphically if it is distinctive. The court noted that Textilis had not furnished any evidence showing that the trade mark in question lacked distinctiveness. In relation to Article 7(1)(e)(iii), the court dismissed the claim simply based on the fact that the contested trade mark does not consist of a shape. The court could therefore not find any valid reason to cancel the trade mark. As there were no reasons to cancel the trade mark the court assessed the infringement. It was held that Textilis used of the design pattern ‘Manhattan’ was trade mark use in Sweden that risked causing harm to at least the origin function of the EUTM. Trade mark infringement could therefore be concluded. This case is highly interesting as it related to the infringement of a very famous and valuable design pattern protected as an EUTM. In this case, the case was decided before the implementation of the amending regulation on March 23, 2016 and the court applied a very strict approach to Article 7(1)(e)(iii) CTMR, as this was then limited to the shape of the goods alone. It would have been interesting to see if the court would have treated the assessment differently considering the wording of the amending regulation which, in its new wording reads “the shape, or another characteristic, which gives substantial value to the goods” (emphasis added). It shall be noted that Textilis has since appealed the judgment to the Svea Court of Appeal. Therefore, if leave of appeal is given, the case will be tried again in full.